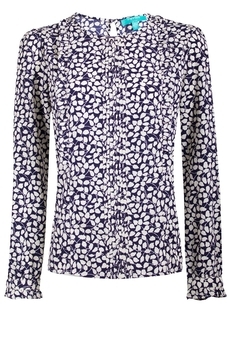 Fever London Morris blouse is inspired by a vintage William Morris-esque print. This pretty loose-fit '40s-style blouse features ruffle detailing, pin tucks on the front, ruffled cuffs and teardrop cut with button at the back. It simply slips on and is approx. 60cm in length. Winter collection. Composition: 100% Polyester. Color: Navy/Cream.